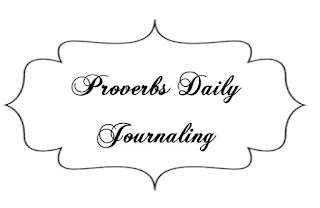 My daughter Lissa and I have decided to start Journaling a personal study of the Book of Proverbs. I love doing Bible Journaling, and have worked it into my study life, I will be sharing that with you here more often as I am using it as an outreach and teaching tool. For this study of proverbs I wanted to journal but not in an artful way. For years my sister Robin and I have been reading the chapter of Proverbs that corresponds with the day of the month. I just somehow never grows old! I wanted to start doing this with Lis too. So this is the plan I have come up with, it is very simple! I purchased a weekly planner at Barnes and Nobel - this is a great time of the year to do this! This is a coloring planner - I'm not planning on coloring it - this type of coloring is very time consuming for me. I purchased this one because I love the color and feel of the paper and the weekly /daily slots suited what I want to do. There are so many planners to choose from! and an Extra Treat: I was able to find a vintage Scofield Leatherbound (original edition) in the KJV for under $10.00! This is a great size bible for carrying and the paper and typeface are an easy read. I am simply underlining in the bible the verse that speaks to me for the day and then either writing that verse or a thought in the day's slot. My daily routine of Bible reading in the morning is OT, Proverbs, NT. I also have several studies going on and preparation for lessons. So yes it is a lot of time in the Word - the benefits are not only here- but eternal and I love it! I am happy to share mine! Thank you. I can see where this would work beautifully to help focus every day on what you are reading and trying to see exactly what the word is telling you! Great idea to journal a message from the Proverbs each day- I love that! I did a journaling group on Proverbs last year- such a great book! I will look forward to seeing how it progresses for you! Oh - I like this concept Ginny - i may just add it to my day. I have read Proverbs annually now for some years, but doing it monthly like this will be a refreshing challenge.